Does anybody have one to try using it outside Hong Kong (through VPN of course)? You'll probably need a HK billing address too. But can't you use a vpn to access their Web based services? Anyone tried? Why would anyone want to pay for it if he has a TVPad? HK$68 a month is not cheap. @BennyLam About $13ish Canadian/$8 US is pretty reasonable if the content is good. It's basically netflix with live and VOD content. The free MyTV version does not work with VPN, I highly doubted MyTV Super will. Yes, I can watch live and catchup TVB on a PC using a HK VPN at mytv.tvb.com. I am new to vpn subscription. I am planning to watch mytv on Sony Bravia Android TV through a 200Mbps fibre connection. 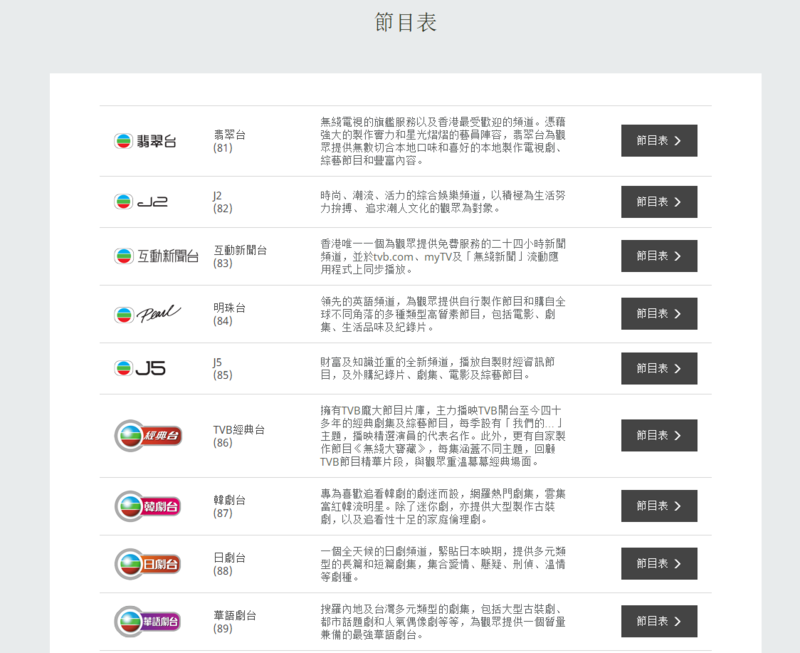 Which HK VPN do you subscribe? What is the minimum bandwidth required for mytv streaming without lag? @yahgoo I have both purevpn and astrill. You connect through their Hong Kong servers through an app or you can manual configure the VPN on a PC as I do. The vpns will slow down your connection but the streams are watchable. Sometimes the HK servers are geo-blocked and I've had to submit tickets for the vpn providers to investigate. I have purevpn and none of their HK servers work for the myTV app. All their 192. * IPs don't work. Can you give more info on getting pureVPN to connect to myTV? @gunnerwrx I have messaged your inbox. @Somebody Hi, I also bought PureVPN but it also doesn't work for MyTV. If you have info, do you mind messaging me as well? Thank you so much. @Somebody - I would very much like to try access MyTV via VPN as well. What's the hidden tricks or special app to make this happen? I do appreciate you willing to share this information. The "secret" only applies to Purevpn as their chat directed me to a specific Hong Kong vpn server address when I told them that I couldn't stream from mytvb. You have to ask your provider why going through their HK VPN you are still geo-blocked. Give them the website address and ask them to investigate. There is no secret trick. You need a PAID vpn. I've forgotten about this thread. Anyway, I joined NordVPN (one month @ $8) the other day to try and see if I can watch live tvb channels on their website. I tried all 3 of their HK servers but to no avail. NordVPN couldn't help me, so I asked for my money back, and they did pay me back. Their customer service is good. Now "Somebody" is saying that you can use a VPN to watch myTV. That is a surprise. If using Purevpn works, then I might join. TVB has been following the footsteps of Netflix by banning VPNs. I opted for the 2 years since I probably will outlive this company and don't know if TVB will eventually find another way to block VPNs. Tvb launched encoreTvb for the US. No need for Vpn. it has all the up to date stuff for VODs but of course the videos are filled with ads.